The Aruba Ostrich Farm is one of the many interesting activities you can enjoy while on the island of Aruba. It is not only fun but very educational. Most adults and children get a kick out of feeding these creatures. If you are not an animal lover you probably won’t enjoy spending more than 15 minutes there. There is a guided tour given every half hour from 9am-4pm, seven days a week. There is a fee of $12 per adult and $6 per child. You can take your own photos while feeding the ostriches if you purchase food from the farm. If you want the farm’s photographer to take your photo don’t bother to purchase the food since they will give you a small amount. The knowledgeable guides will tell you some of the most amazing facts about the ostrich, which is the largest and heaviest bird in the world. 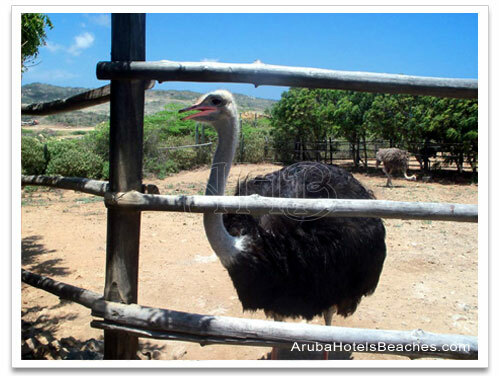 At the Aruba Ostrich Farm you will also learn about the emu which is the second largest bird in the world. Both the ostrich and the emu are not native to Aruba. As you hand feed these assertive creatures, who seem to always be hungry, you will learn about their natural behaviors and their unique survival instincts. The guides will not only teach you about the adult ostriches, but they will take you to see the incubators and pens of the young ostriches and emus. At the Aruba Ostrich Farm you will learn that ostriches have amazing speed and powerful, strong legs. They can’t fly, but boy can they run! They have speeds of up to 43 miles per hour and can even out run leopards. The male ostrich roars and can kick powerfully enough to kill a lion. The ostrich is not a very smart creature and has a brain the size of a walnut, which is actually smaller than their eyeball. They can see as far as 2.2 miles. The Emu is also an interesting bird. I was surprised to find out that the male Emu is the one who incubates the eggs. The Aruba Ostrich Farm has many more interesting facts to teach you about these amazing creatures. While you are there check out the African Art Boutique. This shop has many beautiful wooden crafts made out of teak, mahogany, ebony and other woods. You will see lovely figurines, bowls, tapestries and hand painted ostrich eggs if you are looking for souvenirs. Don’t forget to stop by the Savanna Lodge Bar & Restaurant for lunch, ice-cream, or a cold drink. The food is a fusion of African Caribbean cuisine. They offer ostrich burgers if you are adventurous! They say the meat is red like beef but is low in fat and high in protein. They also offer wraps, salads, and a children’s menu. They have a small playground on the premises for the children to run around and play. If you enjoyed reading about the Aruba Ostrich Farm you might want to check out the Aruba Donkey Sanctuary.